Clerkenwell Design Week 2014: London design brand Pinch has unveiled a dining chair, armchair, side tables and shelving, as well as additions to its existing range. The brand, headed by designer Russel Pinch, showed the collection of wooden furniture at the Design Factory exhibition in the Farmiloe Building during Clerkenwell Design Week in London last week. "As ever, this collection has an emphasis on strong shapes, careful sensitivity to how the pieces will be used, and a dedication to expert making and quality materiality," said Pinch co-founder Oona Bannon. The Avery chair, with its simple silhouette, is available as a dining or armchair. It is made from solid "pippy" English oak, which features small, tight clusters of knots. "We are actively selecting oak with character versus generic mass products where they generally shy away from anything with markings – we celebrate its individuality and personality," Bannon told Dezeen. The Float side tables are hand turned and individually stained in a selection of colours to resemble fishermen's floats. The Lombard bookshelf is made from white oiled oak shelves and light ash rails. "The subtle combination of wood types is something we often employ at Pinch as it gives dimension to the designs," said Bannon. It comes with three stained wood bookends and is available in bespoke sizes. 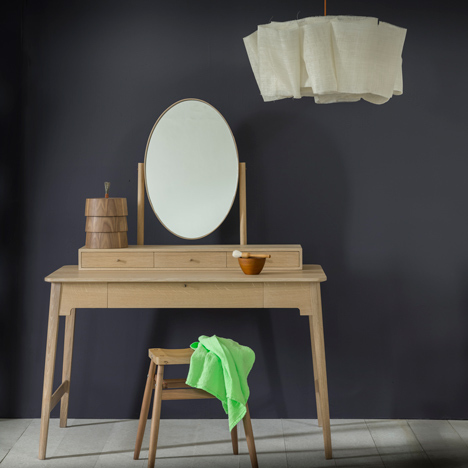 A sideboard available in walnut, cherry or oak was added to the Joyce collection, and a new white oiled oak finish was added for the Clyde table and the Lana dressing table. Pinch is a collaboration between husband and wife team Russell Pinch and Oona Bannon and is run from their studio and showroom in Clapham, London.